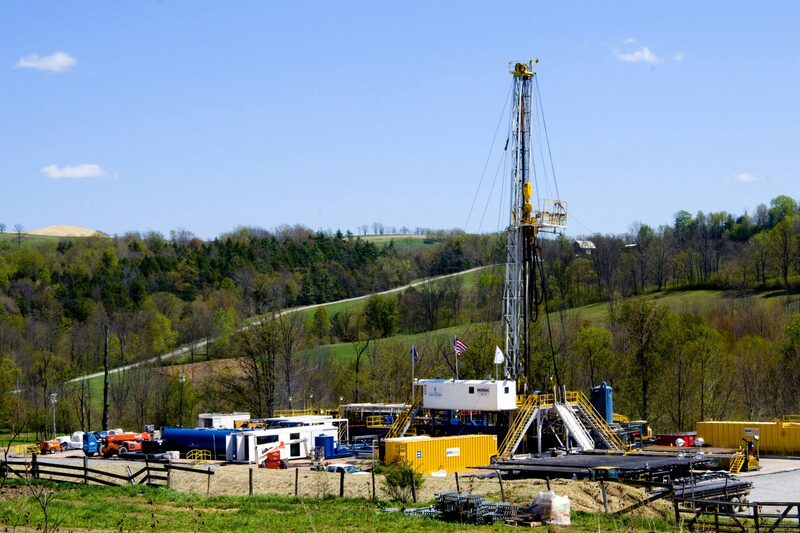 A natural gas well pad in central Pennsylvania, with a home in the foreground. A new study shows infants born to mothers living within a half mile of active fracking sites have a higher risk of low birth weights compared to those living further away. They first looked at infant health data from mothers who lived within 15 kilometers (9.3 miles) of an active well site, and drilled down to look at those that resided between three and 15 kilometers, and those that lived less than three kilometers. The data revealed that babies born to mothers who lived within one kilometer of a well site (.6 mile) were 25 percent more likely to have a low birth weight than if they lived beyond 3 kilometers (about two miles). For mothers with infants who lived farther than three kilometers, researchers found little to no impacts. Janet Currie is an ecomomics professor at Princeton University and an author on the report. Currie says the impacts appear to be very localized. Currie says policymakers should use this growing body of information to balance the clear economic benefits of gas production with protecting residents living very close to fracking sites. “So at this point there are quite a few studies showing that people who live near fracking suffer various health effects,” she said. Currie says the shale gas boom has also provided economic benefits to some residents living close to the activity. The results of her research indicate people would have to live very close. Currie says more data is needed to determine the exact cause, but she thinks it could be truck traffic. She suggested installing air monitors on active well sites. Bernard Goldstein is professor emeritus at the University of Pittsburgh’s graduate school of public health. Goldstein has helped conduct similar research but was not involved in this report. He says it’s a relatively small impact in terms of the individual mother and child, but it does reflect a public health issue that needs further study. “The next thing we should be doing is focusing on getting a better idea of the exposures caused by the whole activity of unconventional shale gas drilling, of which fracking is just part of it,” said Goldstein. Goldstein agrees with Currie that more data on the actual emissions from gas drilling operations needs to be gathered. Children born with low birth weight do have a greater risk of infant mortality, asthma, lower test scores and lower lifetime earnings. But Goldstein cautions that not all mothers living so close to gas wells will have a low-weight baby, nor do all low-weight babies experience health issues. Joan Casey is a postdoctoral scholar at the University of California’s Berkeley School of Public Health. Casey has also researched the impact of fracking on infant health and she says this is an important addition to a growing body of literature. Casey says the study still leaves a gap in the knowledge of what exactly is causing the low birth weights. “We don’t know because there were no actual measures taken where these mothers lived… that piece is still missing and this study doesn’t get us much closer on that end,” she said. Funding for the study was provided by the Environmental Protection Agency and the MacCarther Foundation.